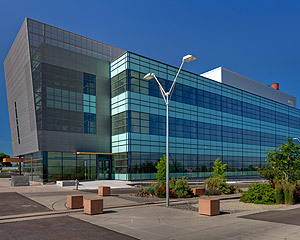 The USTAR building is a new 110,000 SQFT laboratory research building located on the Innovation Campus of Utah State University, Logan, Utah. The three-story steel structure, with a mechanical penthouse, is designed to limit vibrations, in some areas less than 500 micro-inches per second. The building houses a human nutrition area with kitchen and dining areas. One building wing houses research laboratories and another building wing houses a 13,000 Sq Ft Vivarium and 5,000 SqFt of BSL3 (Bio Safety Lab – Level 3) enhanced suites where research with select agents is conducted. The BSL3 suite is designed as an isolated zone from the Vivarium and the rest of the building. This area is intended to function as a “box within a box”, and features strictly controlled access, individual room monitoring, and special security measures. The building has a number of safety features including redundant mechanical systems and emergency power systems. As Commissioning Authority, E Cube developed the commissioning plan and specifications for the Mechanical, Electrical, HVAC Controls, Lighting Controls, Emergency Backup Systems, vivarium, quarantine rooms, wet lab, and freezer farms. This consisted of a comprehensive, multi-stage commissioning process for each piece of major equipment and combined system, which included services such as: on-site pre-functional (installation phase) checkout procedures; start-up testing observation; test & balance review; functional performance checkout procedures; integrated system operation checkout procedures; operation and maintenance manual coordination and review; owner’s staff training coordination; issue identification and resolution expediting; management of all associated documentation and final report to the owner. E Cube also coordinated the BSL Certification process.